Training on hard surfaces can lead to long term injury. Constantly jumping up and down and rolling around on the ground can cause injury due to the stress on your bones and muscles. Fortunately for all the gym junkies out there we have a solution. Direct Mats now offers jigsaw mats and puzzle mats which if used correctly and in conjunction with a well thought out training regiment can reduce the impact of hard training on the body, helping to prevent injury and ensuring maximum fitness. As mentioned above regular training on hard surfaces can lead to impact injuries, bruises and broken bones. While there is no substitute for common sense and taking care during training, with foam mats these injuries can be prevented. The main benefit of these jigsaw mats, the company says, is that they allow individuals to train longer and harder than they otherwise could by reducing the impact on the body. We supply gym mats for high-impact training such as martial arts and cross-fit training, but in practice, these mats are suitable for practically any activity. Thicker puzzle mats are appropriate for more intense, higher impact sports, such as MMA, while lower thickness mats are more suitable for sports like yoga and gymnastics. The majority of our foam mats are made from EVA (ethyl vinyl acetate), a blend of a rubbery copolymer of ethylene and vinyl acetate, often used in the soles of sports shoes. This material has a proven ability to absorb shock and protect delicate joints and tendons from injury. Gym mats come in a variety of thicknesses, tailored for different use scenarios. At the moment, the company supplies puzzle mats in 20mm, 30mm and 40mm widths, as well as a variety of specialised tatami and MMA mats in 40mm. Direct Mats is one of Australia’s leading supplier of gym mats. It currently supplies safety mats to a range of organisations, including schools, sporting clubs, government training details and commercial gyms. Part of the appeal of our products is that they are amenable to practically any environment. Jigsaw mats, in particular, can be customised to any facility or room, offering a temporary or permanent floor covering to improve safety and boost comfort. 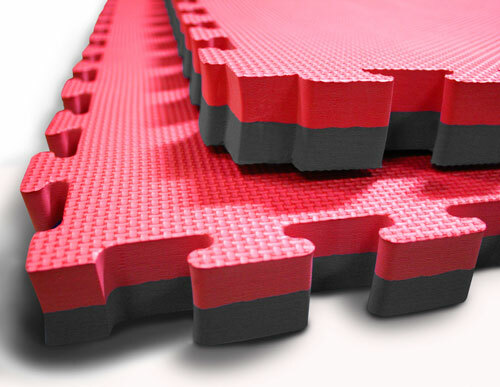 The mats are easy to lay on any floor and are both durable and highly portable. MMA mats are manufactured using heavy duty vinyl. They have a smooth finish, helping to reduce friction burns while providing maximum impact cushioning. Currently, the MMA mats from the company are available in 40mm in either black or grey and offer a low-cost solution compared to other leading brands in the industry. For other martial arts, the company offers tatami mats. These are appropriate for a range of hand-to-hand fighting sports, including judo, jiu-jitsu, aikido, karate, kung fu and BJJ. These foam mats come in a variety of finishes, depending on the customer’s needs.